8-bit vector graphic games were a staple of my childhood. I can remember dropping quarter after quarter in the arcade to play these games that were intensely engaging and loads of fun. From Star Wars to Tron, the simplistic style of those games gave them a charm all their own, setting them apart from the crowd at a time when the art-form was relatively new. Set in the style of the ones that came before it, Spectra steps out to pay homage to those classic games while blazing its own path into the minds of gamers. Mastertronic Games and chiptunes composer Chipzel have come together to take the beautiful art of vector graphics, combine it with cool, upbeat chiptune music and procedurally generated levels to create a game that is unique and easy to get into yet hard to stop playing. 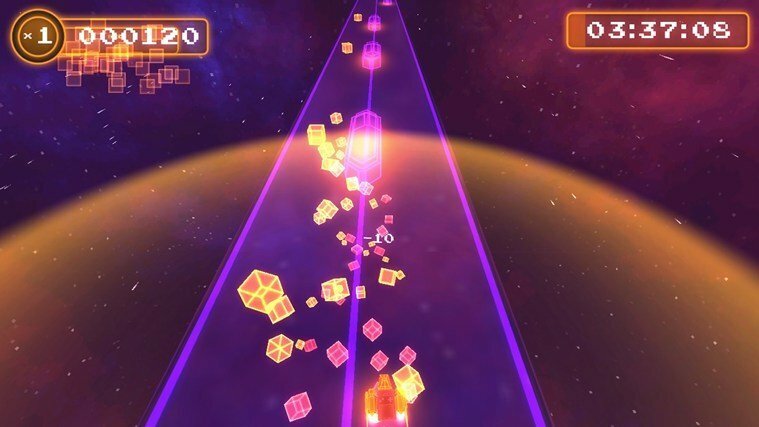 Jump into your ship and blaze your own trail on tracks made solely from ribbons of light. You can hit the speedboosts to improve your track times and gain bonus points. 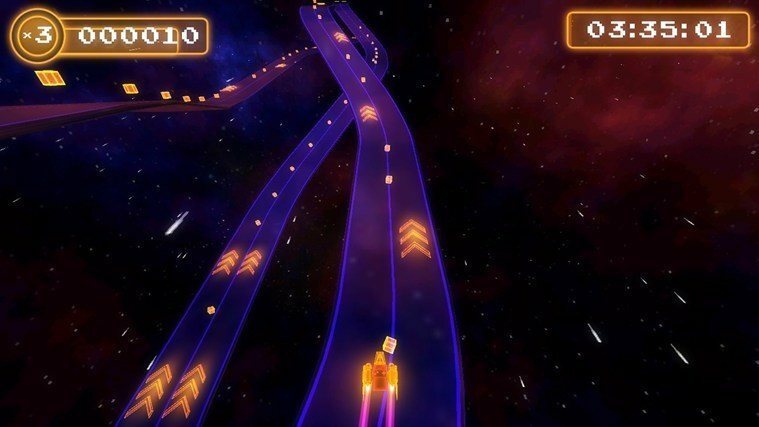 Gameplay in Spectra is very straight forward – guide your ship on procedurally generated race tracks while dodging obstacles and aiming for the speed-boost chevrons to improve your time. There is no accelerate or brake, only the ability to guide your ship left or right in order to maneuver around the track to collect golden, floating points cubes and to dodge the barricades that will pop up on the track. The tracks are generated in response to the tempo and beat of the chiptune that is playing so every race is always different. You can gain points by collecting the cubes as well as coming into slight contact with the barricades or getting a little air by cutting a straight line from one point in a curve to another instead of following the curve around. Your points go into a bank for a couple of seconds before they are added to your overall score, so if you hit a barricade before those points are added, you lose them. Crashing head-on into the barricades will cause you to lose any accumulated points that haven’t been deposited into your overall point total. The graphics in Spectra is what sets this game apart from other racing games that are out today. 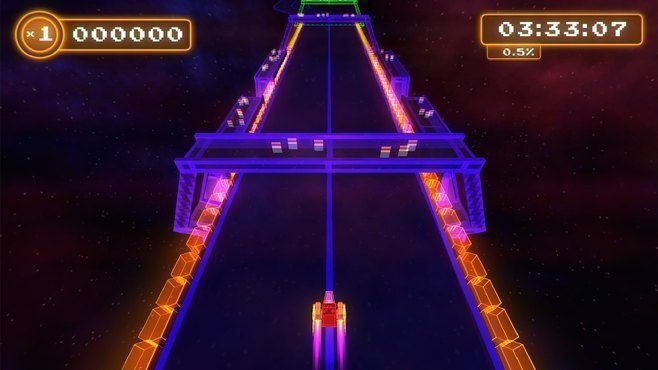 The levels are all created in cool, retro-style vector graphics that gives the game a simple feel all while allowing you to concentrate on the next stretch of track. The colors are bright and fun and when you hit an obstacle, you get an explosion of pixels that fills the screen in brilliant light. All the action takes place out in interstellar space so the background is filled with radiant stars of differing intensity so you feel as if you are actually there. Even the design of your ship, a small red Game Boy with golden rocket boosters attached to the sides, is unique and flows with the whole aesthetic of the game. Those cubes are points just waiting to be snatched up. Grab all that you can to get the highest scores possible. Mastertronic Games approached chiptunes legend Chipzel to put together an exclusive 10 song soundtrack for this game and the music is really the focal point of the whole Spectra experience. The dynamic beats of the music really help to immerse you in the game while also being the catalyst for how each of the levels is generated as you make your way down the tracks. 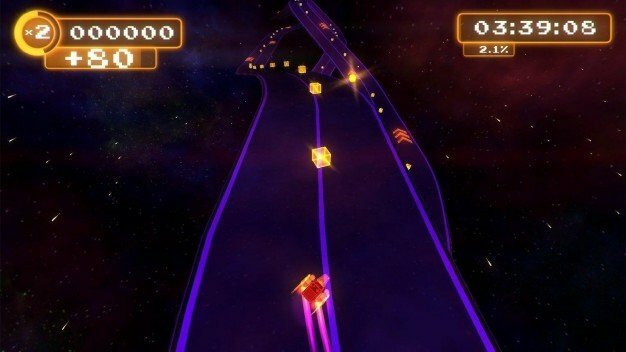 Each song is uniquely different and you will soon find your favorite as you replay the tracks to beat your previous scores or just to make it to the end of the long levels. There are no other sound effects really except for when you come in contact with a barricade but I think this was done so that the music really stands out as you play the game. This is some of the best chiptunes music that I have heard in a long time and it really took me back to those old arcades and the way music played such and important role in how the game made you feel while playing it. The levels are procedurally generated so you will never race the same track twice. While Spectra takes an uncommon approach to the racing genre, the idea seemed to fall flat and it is immediately noticeable. The difficulty of the levels is ramped up simply by the game adding more and more barricades to get in your way. In addition, having no control over the speed of your ship other than being able to hit the speedboosts made the game feel more like a mobile game instead of an arcade game, which was a huge turnoff for me. While the music is awesome, it quickly got repetitive in the later levels and lost some of its charm as you are forced to listen to only that one song on the particular level that it is featured on. I will admit that as I was playing, getting close to the end of the race made my heart pound a little with excitement as I didn’t want to fail that close to crossing the finish line. However, the lack of other racers to compete with coupled with the lack of depth in the gameplay left me feeling unfulfilled. Spectra is available now on PC, Xbox One, Mac and Linux for $7.49 which I think is a little steep for what this game has to offer but if you are into this type of casual gaming, it might be worth your money and time.